Irina Radchenko is an associate professor at ITMO University (St.Petersburg). Previously, she served as an associate professor and an advisor to director for online media at Higher School of Economics (Moscow). Irina holds a Candidate of Science in System Analysis degree from Baltic State Technical University (St.Petersburg). Her major research interests are focused on Data Science, Open Science, Open Education, Open Data and the development of Intelligent Systems. 2013 — The development of Monitoring System of Scientific Activities to improve the efficiency of decision-making by the Officers of Russian Universities. 2012 — The development of Hardware and Software Designed for Enterprise Management and Economic Sectors of Modern Russia. 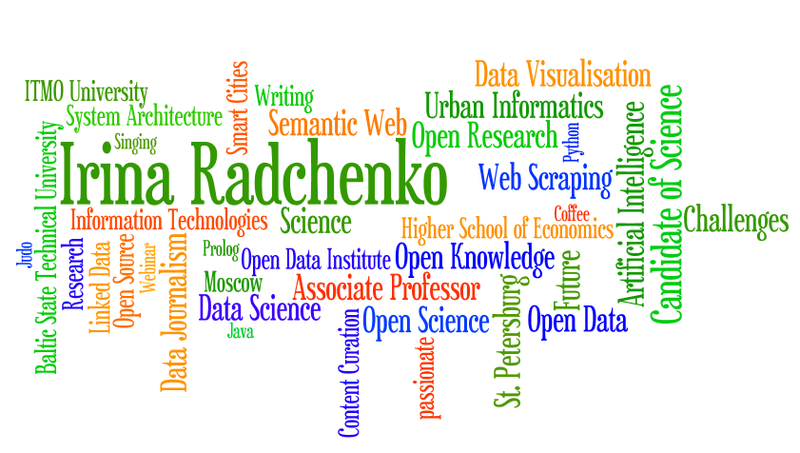 2012 — The development of Russian Public Information Resource of Open Data in Science and Engineering, which will be integrated into LOD-cloud. 2012 — The development of the Open Data concept of Russian Federation for the State Contract № GK-142-OF/201, September 5, 2012 with the Ministry of economic development.